I believe that racism and sexism are still ongoing throughout the church. I believe that through diversity and inclusivity all of us can finally say, “We are church together.” I believe that everyone, regardless of race, gender identity, sexual orientation, ethnicity, age, disability or religious affiliation, will be treated with the same compassion and love that Jesus has shown us. An issue I’m passionate about is the effect of immigration policies and discrimination that kids, youth and young adults face at the present time. And I pray that God will help and guide them as they face these burdens. I taught youth in my congregation how to play different instruments so they could participate in worship. Our church has made great strides in getting more kids and youth involved in worship so they don’t feel left behind. Once a month we have a contemporary service led by kids and youth. People are surprised that there is an ethnic church in the Rocky Mountain Synod. Most people are also surprised that I’m still very rooted in my Batak culture because I was brought up in America from age 10. When I talk to people about my church, I tell them we are an Indonesian congregation where all are welcome. It’s important to me to help create a safe space for young people of color to talk about their experience dealing with racism because it is needed. Racism still happens and will happen to young people of color living in today’s America. It’s hard to talk about racism to someone who has never experienced it; hence, it’s imperative that there be a safe space for young people of color to talk about racism. As a child, when I was sick, I was given medicine. For the sickness of racism, the medicine is that safe space for discussion. To me, grace means love. Most people think that just because we are an Indonesian congregation we are not Lutheran. Well, we can be both Indonesian and Lutheran. Most people also think that I’m uneducated, and they’re surprised when I tell them that I got my bachelor’s degree in mathematics, minoring in computer science and religious studies, from the University of Colorado Boulder. I share my faith by helping youth and young adults to be more involved inside and outside of the church. I share my faith by creating relationships with people who have different backgrounds. I share my faith by loving my neighbor regardless of their race, gender identity, sexual orientation, ethnicity, age, disability or religious affiliation. I’m a Lutheran by choice. I was saved not because of what I did but because of God’s grace. Love is a gift that God has given me, so it’s a gift I also share with others. To me, church is a place where I feel safe. 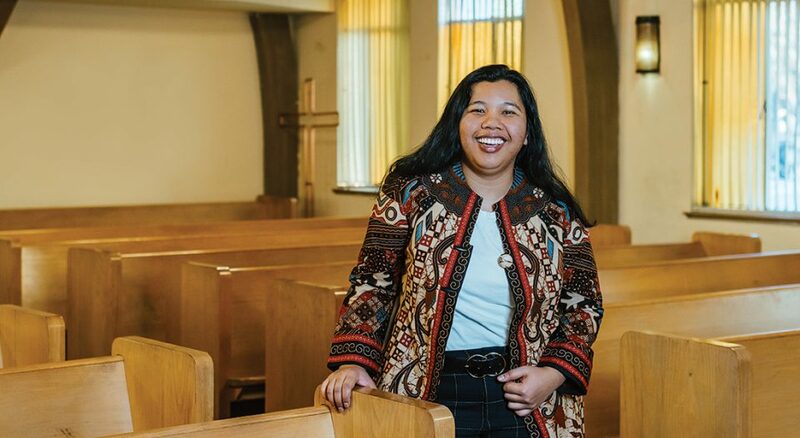 I wanted to be part of helping Auraria Campus, a new Lutheran campus ministry in Denver, because it addresses the lack of diversity within the Rocky Mountain Synod. Drawn from three different schools (Metropolitan State University, Community College of Denver, and University of Colorado Denver), the ministry gives college students a safe space to be themselves. It’s important to me to be involved in youth and young adult ministry because these people are the next generation of Lutherans. Churches and synods need to invest in all youth and faith formation directors. Be kind, be mindful and be open to new ideas coming from the young.